If you want to host your website at Doteasy, you need to use our name servers. Once your Transfer Hosting request has been received and processed, our system will send you an email containing the necessary DNS and Domain Technical Contact changes you need to make to complete your account activation process. These changes simply notify your domain name handler that you will be using Doteasy as your domain name’s web hosting service provider. You can also find the Doteasy name servers information in your Doteasy Member Zone. Under Domain Settings select View DNS Info. 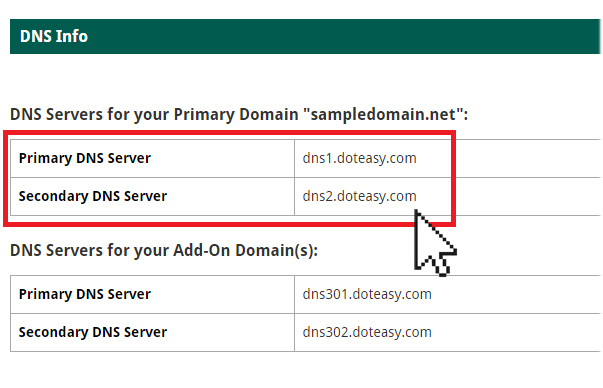 The Doteasy name servers for your account will be listed under DNS Servers for your Primary Domain. Simply copy and paste the Doteasy name servers into your domain name handler’s domain management panel and changes will automatically take effect after a 24-48 hr propagation period.